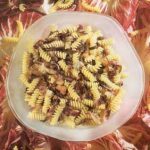 This is a typically Venetian recipe that Francesco brought from home. 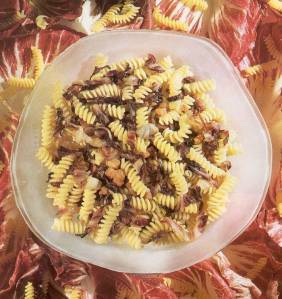 “I did not serve it in Remi at first,” he says, “because i was afraid it was not really to the American taste.” But the combination of bitter radicchio with the slightly smokey bacon soothed with a bit of butter and cheese is irresistible and now has a permanent place on the menu. Bring a large pot of salted water to a boil for the Fusilli. Meanwhile, heat the oil in a large, heavy skillet. Add the bacon and saute over medium heat until it just begins to brown. Add the radicchio and stir-fry for a few minutes, until it begins to wilt. Add a few tablespoons water and continue to cook the radicchio and bacon together until the radicchio is tender. When the water for the pasta is boiling, add the fusilli and cook it about 8 minutes, until it is al dente. Drain it well, then transfer it to the skillet with the radicchio and bacon and toss them together. Add the butter. Serve at once with grated cheese on the side. Thank you Susan, I updated that. The list of ingredients is missing the bacon (or pancetta)!